Tvåvånings villa med 5 sovrum, 5 badrum, ett vardagsrum och matplats på bottenvåningen. Trädgård med utsikt över havet, terrass med utsikt över havet och bergen, grill, parkering, pool, hus alla inhägnade. Fullt utrustat kök med brödrost, mikrovågsugn, mixer, brödrost. Fullt utrustat tvättstuga med tvättmaskin och torktumlare. Öppen spis. Ljud på DVD, radio, cd. Kabel-TV, och wi-fi internet. Grill. Bländande för dem som älskar naturen. I really enjoyed to stay in Villa Calheta. It is situated in the middle of the small village. The view is magical there is lots of space in the house. Still it feels friendly. When we arrived we were cold inside the house but we could set a fire and get warm there. I highly recommend the house and the couple working there to keep the house nice is doing a fantastic job. The house was so clean. Thank you so much for your comment. We do our Best for our clients. Thank you for your most kind review on Homeaway and particularly for praising efforts of the couple working there, Gorete and Jose . They are very dedicated. Thank you for being our guest and thank you for sharing your positive experience of Village Calheta with other Homeaway readers. Wir haben die Ruhe und den wunderschönen Ausblick von der Villa aus genossen, um zu arbeiten. Das war in der gut ausgestatteten Villa wunderbar möglich. Einzig das wlan-Netz ließ uns ab und zu im Stich ;-) vielen lieben Dank Lili für diesen tollen Ort! How good is this place. We had a fantastic time. The house is equipped with everything. We had everything around and more. Such a amazing place. Thank you so much. We loved it! Had a lovely family holiday in the Village Calheta. Great amenities and a nice quiet and clean beach. Gorete and Jose were genuinely friendly and very helpful to welcome us. Quality of the rooms was good. Good variety of restaurant options nearest the house. Good quality and the food is very good. Nice aquatic sports options. Easy to Park at the Village. If you don't want hire a Car they have transport service a very good price. Stunning Sunrise and unforgettable sunset. We loved and will be back for sure. You, your family and friends are very welcome. The Village is situated in a fantastic place and we are proud to supply our best service to our clients. The location of the Village is close to everything. Thank you so much to Gorete and Jose to. They are fantastic and always available to support our clients like a family. Liliana Moniz made everything about our booking easy and effective with quick responses. Her villa is lovely and finished to a very high standard. Barbecue and pizza oven included. Pool lovely. Climate in Caheta also excellent. Gorete and Jose keep the place clean and tidy and are good value for the cleaning service. Madeira is magical regarding views, beauty and activities but most of all the people. Great beach facilities at Calheta, Ponta del Sol and Magdelena Del Mar. Driving is interesting off the main routes as the island is steep, but tunnels make trips substantially shorter. Great admiration for such a hard working people making a living on such a steep island. Wildness breathtaking and lavadas quite wonderful in concept and scale. 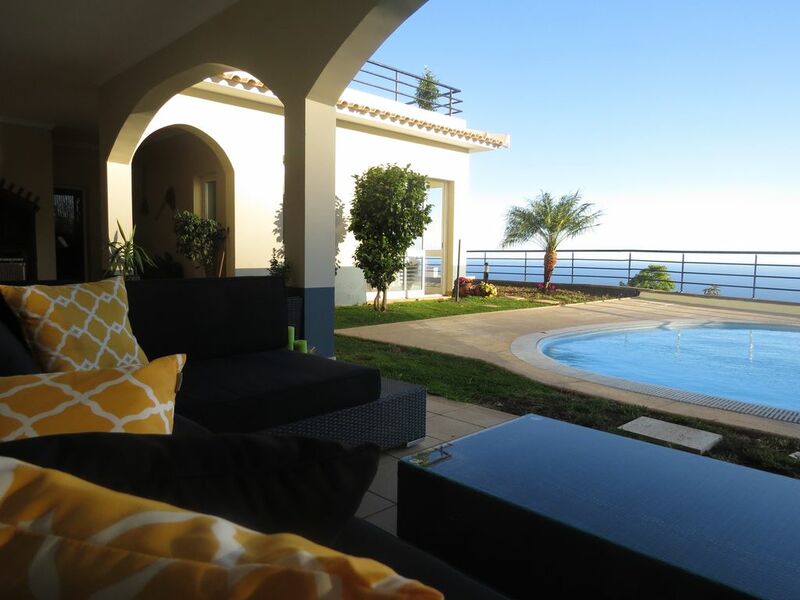 Great place to vacation and Villa Moniz a wonderful place to base yourself. Many thanks to Liliana. Thank you so much for your brilliant feedback on HomeAway family website. It is very rewarding to receive positive feedback from our valued guest regarding their experience. Indeed, we are passionate about making our guests’ stay as flawless as ever and of course knowing that your stay was a wonderful one warms my heart. We highly appreciate your good review and we will not miss to share with our team this encouraging comments of yours. It will be a real pleasure to have the chance of welcoming you and your family back at our Stunning Village and beautiful Island very soon.. Always available for any help. Thank you so Much Family Kemp. The Village is superb. Very clean. Our welcome was so friendly. Weather was fantastic. The view is stunning. Very good location with everything what we need around. To visit the rest of the Island is important have car however they have a transfer service and we use when we can. We totally recommend and I and my family will be back. Thank you so much. Was a pleasure have you and your family in our house.